The University of Massachusetts Amherst has teamed up with MakerBot to install the first MakerBot Innovation Center at a university library. Opening this Thursday, the 3D printing center is located in the Digital Media Lab at the institution's Du Bois Library, a facility focused on project-based learning and innovation. UMass Amherst students and faculty — as well as the surrounding community — will have access to 50 MakerBot Replicator 3D printers, a large supply of MakerBot PLA filament and several MakerBot Digitizer desktop 3D scanners, all supported by MakerBot MakerCare protection plans. The MakerBot Innovation Center Management Platform links all of the 3D Printers together, provides remote access, print queuing and mass production of 3D prints. 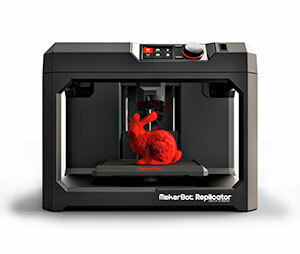 The center's scalable design will make it easy to add other MakerBot 3D printing technology in the future. MakerBot is also providing training for university staff. "The MakerBot Innovation Center ties in firmly with the campus's personality of being entrepreneurial and community engaged and will allow us to work more closely with the local business community," said Jay Schafer, director of libraries at UMass Amherst, in a press release. "Having a large-scale installation of MakerBot 3D Printers makes this resource more broadly available on campus and puts UMass Amherst at the forefront of technological innovation. The MakerBot Innovation Center will help bridge the gap between the digital and the physical realm, so students can turn designs into 3D physical objects and prototypes." The center is intended to foster cross-disciplinary collaboration, according to Schafer. For instance, a group of faculty from environmental conservation, building and construction technology, biology, public health, public policy and engineering plans to offer a makerspace class that will use the MakerBot Innovation Center as a resource for projects centered on remote sensing, environmental monitoring and building control systems. UMass Amherst will also be able to "forge public-private partnerships with industry leaders to create a vibrant innovation hub that serves both students and the local business community," according to a press release. Plans include an entrepreneur-in-residence program, mini-courses and workshops geared toward practicing professionals, elevator pitch and business plan competitions, incubator spaces and coaching support for new-venture start-ups and support for small business development.